IDJ: In the postwar years mid-stream ship cargo-handling was normal in Hong Kong but the territory was also aware of the great revolution being generated by the world movement towards unitization of cargoes. Godown and shipping companies were routinely recommending to shippers that cargo packages should be less than two-tons in weight (2,032 kilos) and less than forty cubic feet (1,133 cu.m.) in bulk. Shippers were already making intensive use of palletized cargo on services to the United States. 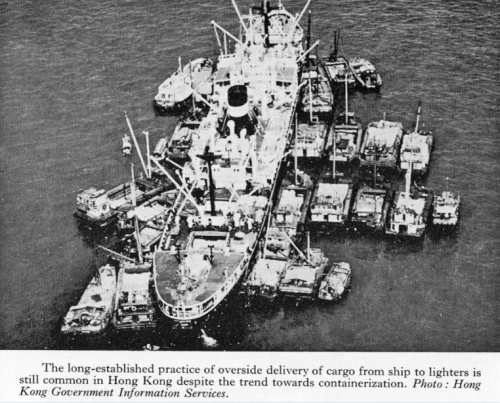 In 1966, both government and private institutions in Hong Kong began studying developments in containerized cargo handling. It was widely accepted that containerization was inevitable if the port was to retain its position as a major port of call in the Far East, and its reputation as an efficient and economic center for cargo handling. However, it was only in about 1968 that containerization received a much wider impetuous in this part of the world when the response by nearby countries became unexpectedly vigorous. Singapore was actively preparing to commission its new container port by late 1969 and had started planning container feeder-services to five ports in Malaysia. Japan had also begun building several container ports as container shipments between the west coast of the United States and Japan were already well established. A start had been made in developing container services between Europe, Australia and Japan. A new hierarchy of ports was evolving in which it appeared that a few main ports operating on an intensive scale would relegate other ports to a minor feeder status.The position of Hong Kong in this hierarchy would largely depend on the progress of its containerization infrastructure program. Image 2 Circa 1970-Gin Drinkers Bay gradually being filled in with the reclamation extended out into the Rambler Channel. The high ground in the foreground on the right with electricity pylons was originally an island and was to become the point where the first Tsing Yi road bridge lifted off to cross the Rambler Channel to Tsing Yi Island. However in Hong Kong containerization faced special problems. Because of the predominance of general cargo and small consignments in the import and export trades, and a great lack of stacking or storage areas in the thousands of small high-rise factories, Hong Kong goods would have to be packed and unpacked at the container terminal depots and moved from there by conventional means, i.e. small trucks and vans. This negated the ideal ‘door-to-door flow line system’ which generated great savings in handling costs. The more heterogeneous the cargo consignments and the more numerous their destinations, the greater were the organizational problems.The highly unbalanced volumes of Hong Kong’s import and export trades also presented issues in maintaining a parallel export-import flow of fully-loaded containers. Image 3 May 1971-Kowloon-Pier No. 5-now the location of the China Ferry terminal-The government dockyard is in the background and has been reclaimed as part of the West Kowloon development project. The container ship is a SEA-LAND vessel from the USA. Nevertheless, the port could still benefit from the reduced turn-round times of shippingand the quicker transit of cargoes. The export of a variety of Hong Kong pro­ducts, such as cameras, clocks and textiles had for some time enjoyed favourable shipping rates. Clothing and garments, which were the leading items of export by value greatly benefited from the ‘hangtainers’ built by the Hong Kong and Kowloon Wharf and Godown Company which provided wardrobe quality packing that eliminated garment cleaning and pressing before being distributed for retail sale at destination shops. 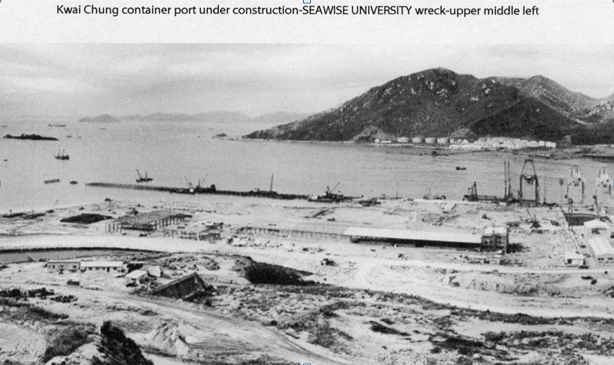 Research directed by the government in 1966 resulted in recom­mendations by the Container Committee for a $261 million, 115 acre projectto provide a four-berth container terminal at Kwai Chung to be built in stages within six years. (At what was the entrance of the un-reclaimed Gin Drinkers Bay) As with all previous attempts to improve port facilities, the government was only one of many interested parties in the development of this terminal; private enterprise was encouraged to come forward with its own proposals. Image 4 1972-View from above the present Lai King MTR station area. Tsing Yi Island in the background still cut-off except for marine access. The power station was on the seaward side of the hill, a new fuel tank farm built by the oil companies displaced from urban sites is visible. To the right on the north-side of the island facing Tsuen Wan was a number of small shipyards. 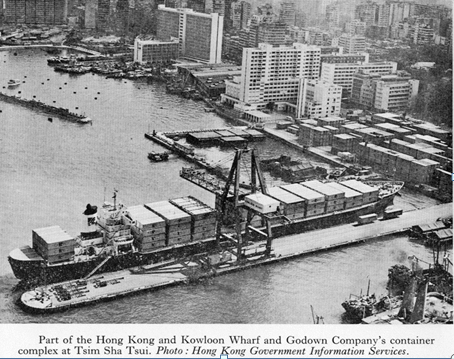 Following the publication of the Container Committee’s report on the Kwai Chung project, the Hong Kong and Kowloon Wharf and Godown Company announced in mid-1967 its alternative plan for a three-berth container terminal to be constructed at the northern end of their premises at Tsim Sha Tsui. 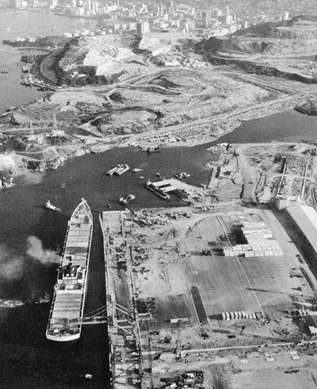 And early in 1969, the North Point Wharves company, a subsidiary of the China Provident Company, also proposed to develop a container-ship berth at North Point, with a marshalling yard and back-up facilities at Ngau Tau Kok on the other side of the harbour with a physical link provided by a cargo-ferry service. 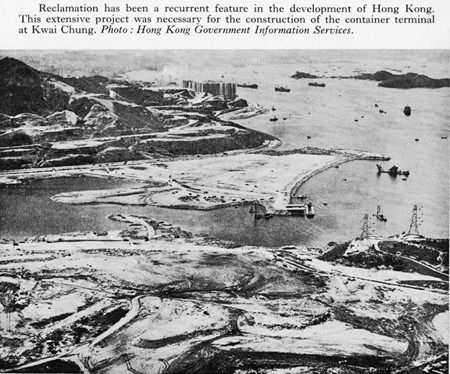 The Kowloon Wharf and Godown Company plan was to redevelop part of its existing property to include a reclamation site of twenty-nine acres incorporating their No’s 4 and 5 piers. Because of the economies gained by adapting existing equipment and facilities, the cost of this project was estimated at only $70 million. The company already had experience of handling 400 containers a month in 1966 and up to 800 a month in 1968. Initially it considered the expensive Kwai Chung project unwarranted until firm guidance was given by shipping companies on the expected numbers and frequencies of container-ship services to Hong Kong. Image 5 1972-This container pier on Hong Kong island at North Point was increasingly hemmed in by residential areas, the Power Station and Electric Road. A comparison of the three proposed schemes showed that the Tsim Sha Tsui site had the advantage of its central position in the harbour with ready access to existing warehouses where indoor sorting and packing facilities and covered loading space was already provided. The North Point site, although further away from the centre and relatively more exposed, enjoyed the same advantage of ready access to existing ware­houses. There was also a vast range of back-up facilities forcargo movement such as mobile-cranes, trailers, fork-lift trucks, pallets and dumb-lighters/barges to consider. 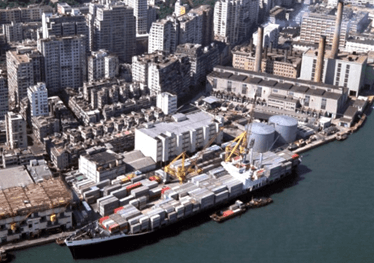 The central position of the Tsim Sha Tsui site was important because of the physical layout of the port and the type of cargo it handled which called for the frequent use of lighters and their tugs/motor-boats that were based mainly in the typhoon shelters at Yau Ma Tei and Causeway Bay. Lighter trips to and from the Tsim Sha Tsui piers were relatively short, but the lack of space for expansion was a very serious drawback. The same applied to the relatively narrow North Point site. North Point Wharves also developed its own container terminal on the island, (next to Hong Kong Electric’s North Point Power Stations). It was backed by a ten-acre freight depot across the harbour in Kwun Tong. Image 6 September 1972-first purpose built container ship to berth at the new terminal at Kwai Chung. Berth and container handing areas still incomplete. Gin Drinkers Bay continues to be reclaimed. Tsuen Wan town is in the background. At Kwai Chung, the first container-berth owned by Modern Terminals Ltd., a private company, was opened to service a container-ship in September 1972. The second berth was expected to be operational in January 1973 and the third by mid-1973. To enable the new very large container-ships to reach the berths at Kwai Chung, the government dredged more than three-million cubic yards of seabed material from the Rambler Channel to provide a depth 40 feet below chart datum which was the minimum required for these vessels. (Not helped by the sunken wreck of the R.M.S. Queen Elizabeth/SEAWISE UNIVERSITY lying at one side of the channel) One and a half miles of access roads to the terminal were built to link up with the nearby trunk road system that was known as the Kowloon Foothills Road corridor which was completed in 1975, and is now known as the very busy Kwai Chung Road and Tsing Kwai Highway. The move towards containerization presented a major challenge for the port’s traditional buoy-lighter-lorry chain of cargo handling. Besides the large-scale readjustment and modification in equipment and physical layout, tremendous social problems were expected to arise from labour redundancies, retraining and re-employment. Palletization enabled a work-gang to handle fifty to sixty tons an hour instead of the loose cargo average of fifteen tons. When full containerization was deve­loped the loading per gang-hour was expected to reach 150 tons or more. These figures provide some indication of the degree of labour redundancy expected, although the complete containerization of cargoes in Hong Kong was thought unlikely to happen. Lighters with cargo-handling derricks constructed from steel were being built for the large wharf and godown companies, capable of dispatching eight containers at a time to and from container-ships. Many on the traditional lighter owning merchants with fleets of wooden cargo-junks would not cope with the rigid fixed size steel containers and had to follow this lead if they wanted to stay in business. The intervening years tell us that all container handing in the territory successfully migrated to vast purpose built terminals, and that the former marine industrial piers and wharves have been redeveloped into commercial and residential facilities changing the shape and face of the harbour. And, Hong Kong has progressed to maintain its place as one of the world’s leading container ports. This article was first posted on 30th June 2014. Image 6 shows the first fully containerized vessel, The Hong Kong Express, belongs to Hapag Lloyd, purposely named to the opening of Modern Terminal Ltd. The vessel is 60,000 tonns class, capable of carrying 3,000 teu. The speed is between 23-26 knots per hour. It takes only 21 days to arrive Europe main ports via the Suez Canel.